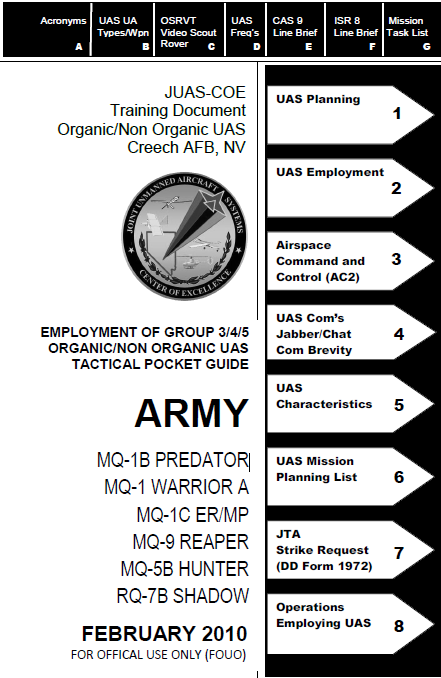 THIS POCKET GUIDE PROVIDES INFORMATION USED BY BATTLE STAFFS INVOLVED IN PLANNING, COORDINATING, SYNCHRONIZING OR EXECUTING ACTIONS THAT SUPPORT THE EFFECTIVE EMPLOYMENT OF UNMANNED AIRCRAFT SYSTEMS (UAS) ON THE BATTLEFIELD. ALTHOUGH THIS POCKET GUIDE IS PRIMARILY FOCUSED ON NON-ORGANIC UAS, THOSE ASSETS CONTROLLED AT DIVISION LEVEL OR HIGHER, BOTH ORGANIC AND NON-ORGANIC UAS ARE STILL NEW TOOLS TO MOST UNITS. 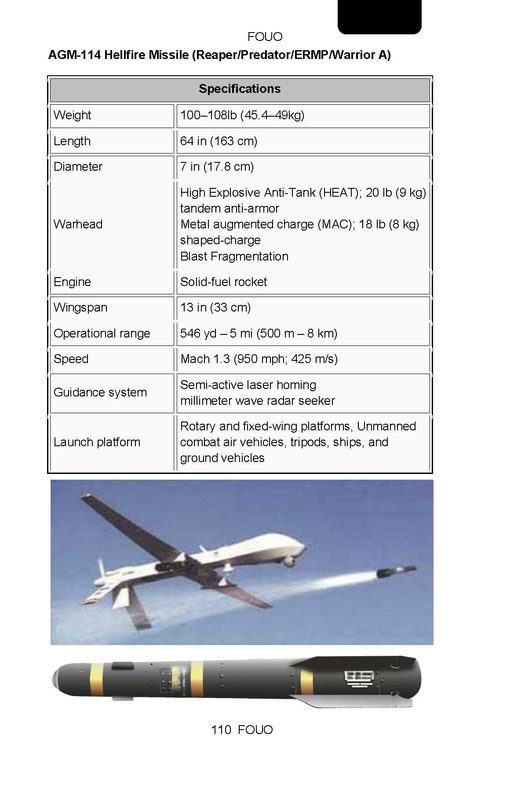 UNDERSTANDING THE CAPABILITIES AND LIMITATIONS OF UAS CURRENTLY USED BY U.S. FORCES WILL HELP STAFFS MORE EFFECTIVELY USE THESE KEY ASSETS TO THE FULLEST POTENTIAL IN SUPPORT OF GROUND UNIT OPERATIONS. UAS currently bring numerous ISR and Tactical Air Support capabilities to Army units, providing near-real-time reconnaissance, surveillance, and target acquisition (RSTA) and fires. They can be employed on the forward line of own troops (FLOT), on the flanks, or in rear areas. 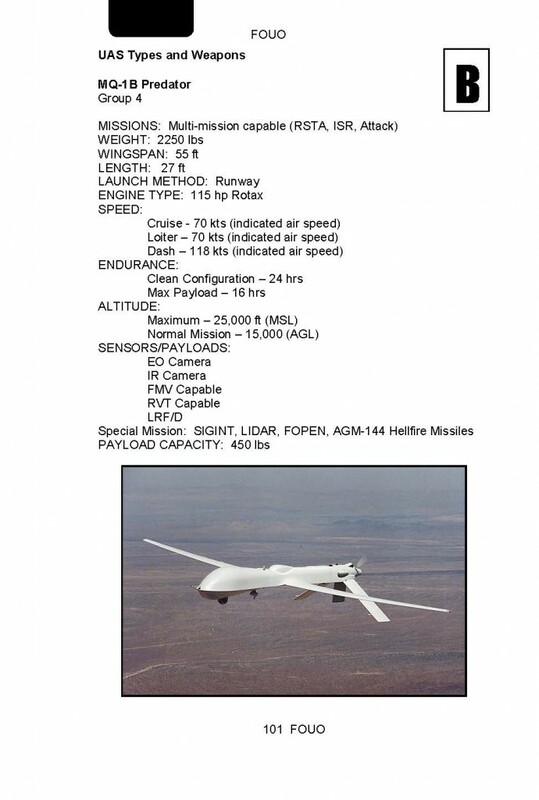 Employed as a team, UAS and manned systems provide excellent reconnaissance and attack resolution. Most UA can be fitted with laser designators to mark targets and others may be armed. Other key capabilities include route, area, and zone reconnaissance, Battle Damage Assessment (BDA), passing target coordinates, teaming with manned systems, and communication relay. Planning for organic and non-organic UA as an integrated element within the combined arms team can be challenging and is essential. In general, employment of UAS support of tactical operations falls into two major categories: ISR and Tactical Air Support. Specific employment of UAS capabilities and platforms are a function of enemy, terrain, weather, troop location, support, time availability, and civil considerations (METT-TC). 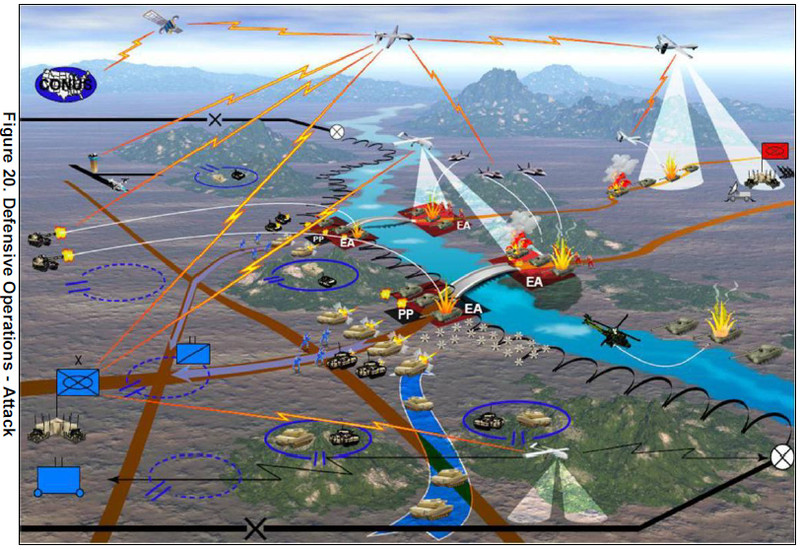 ISR Missions – ISR is an activity that synchronizes and integrates the planning and operation of sensors, assets and processing, exploitation, dissemination systems in direct support of current and future operations. UAS ISR missions are broadly considered tactical air reconnaissance or surveillance. Reconnaissance – Reconnaissance missions obtain combat information about enemy and indigenous population activities and resources through sensor payloads. Route Reconnaissance – Is the directed effort to obtain detailed information of a specified route and all terrain from which the enemy could influence movement along that route. UAS, with multi-sensor capabilities, are well-suited to reconnoiter the front, flanks and rear providing early warning, ambush detection, and over watch. Additional UAS support roles are: ground element over watch, trafficability assessment, landing site and hazard location, threat and suspicious item identification. The best results occur when synchronized and commanded by ground elements. Kill Boxes – is a three-dimensional fire support coordinating measure (FSCM) used to facilitate the expeditious air-to-surface lethal attack of targets, which may be augmented by or integrated with surface-to-surface indirect fires. 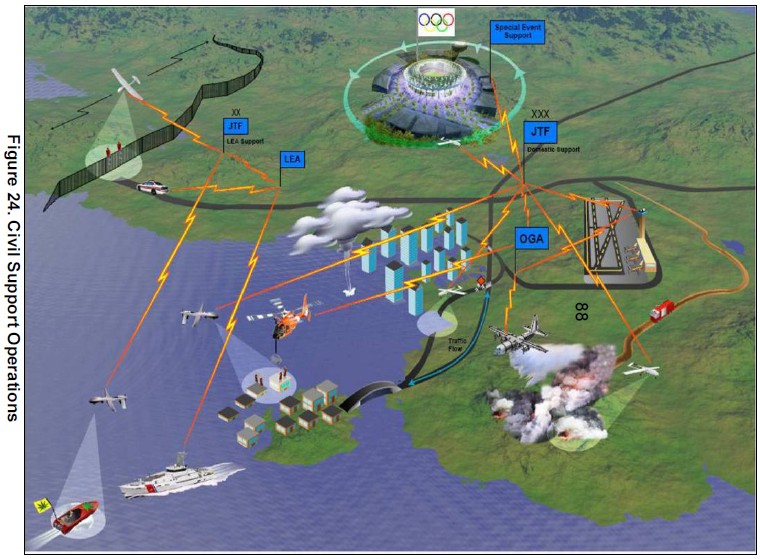 Restricted operating zones/areas (ROZ/ROA) – is airspace of defined dimensions created in response to specific operational situations (e.g. UAS launch and recovery zone) or requirements within which the operation of one or more airspace users is restricted.